Occasionally, we have the opportunity to understand common words in a new light. I had such an opportunity this week. An article in the school newspaper sparked several responses after it called on students to be more liberal. The premise of the article was that to be liberal is to be open-minded. The student writer appeared to be implying that because most of the student body is Lutheran, and because most of the students' parents are also Lutheran, that they must therefore not be very open-minded. Among her concluding remarks was the statement, "maybe you’ll choose to leave the comfort of your family church nest and find something more suited to your beliefs, not those of mom or dad." Is open-mindedness a good thing? I think it is. But unfortunately, most everyone seems to think the word means something other than what it means. The relativism that seeps into almost every aspect of society—and even into the church—has latched onto "open-mindedness," and it seems to be one of its favorite catchphrases. When most people tell you to be open-minded, they may not mean to consider that what you believe may not actually be the truth. They probably are asking you to consider that you might like something else better. Or, if not, you should always try new things, because variety is the spice of life. When a non-denominational Christian asks a Lutheran to be open-minded, he just might think it is like asking someone who eats ethnic German foods to try Italian instead—not because one is more healthy than the other, but just for variety. It appears that open-mindedness, at least to many people, comes pre-packaged with the understanding that all paths are equally valid. Especially concerning religion, which humanism regards as little more than comfort food, there is a sense that all religions exist for the purpose of making people happy. So you might as well be open-minded. Sample a few. Find one that suits you. 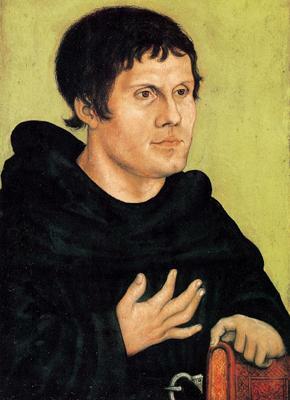 On this festival of Reformation, I am thankful that Martin Luther was open-minded in the true sense of the word. After spending much time in the Word, he came to realize that what the Catholic Church taught was not actually the truth. The truth. Not a truth, not my truth, but real truth. I am thankful that Lutherans in general are a very open-minded church body, who are capable of self-examination in light of Scripture. I am thankful that God has opened my heart and mind in order that I might see the truth, which is hidden from those whose hearts are hardened. May God open all of our minds to his life-giving Word! Amen. Does this apply to the the possibility of using video games as a tool of outreach or faith-strengthening? Ha! I agree with this post wholeheartedly, however. The term "open-minded" has been so abused, I wonder if many people are even capable of understanding it in the true sense anymore.